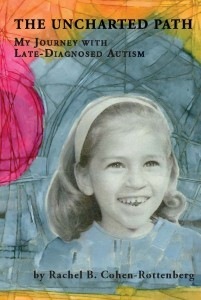 I reviewed The Uncharted Path: My Journey with Late-Diagnosed Autism by Rachel B. Cohen-Rottenberg. Rachel Cohen-Rottenberg’s book is an insightful gem that gives us glimpses into her life from early childhood to adulthood showing decades of struggles before she is diagnosed. She survives her possibly, autistic father’s harsh, abusive temper and her mother’s controlling ways. Elementary school’s social challenges are overcome by the game of baseball and being a “tough tomboy.” High school is harder as she sees herself “outside the social bubble,” yet again, until she finds her niche. This time it is her gift for music along with the ability to mimic others that saves her. Rachel acknowledges that analyzing social situations and figuring out human motivations has become a favorite pastime that along with list making is a survival strategy. She continues to use these strategies through her college and graduate school years where she develops severe insomnia. She manages this with medication and Rachel goes on to have a successful career as a technical writer. She meets her first husband at a company softball game; they marry two years later. Rachel joyfully becomes a mother two years after this. Once again her organized lists and determination help her be a good parent while working around an inability to take part in loud and crowded activities with her daughter. Rachel continues to do well even homeschooling her daughter while working from home. However, the effort it takes to overcome abuse from her childhood, ignore her sensory issues, and work at social situations finally takes its toll a few years after she divorces and remarries. Increased sensitivity to her environment causes a temporary home bound status while she and her husband strategize to find solutions. Rachel’s determination again pulls her through this, and she finally reaches a place of acceptance of who she is and becomes an advocate and inspiration for those on the autism spectrum. The winner will receive a copy of The Uncharted Path: My Journey with Late-Diagnosed Autism by Rachel B. Cohen-Rottenberg. Due to postal charges only United States residents may enter this contest. You may leave a respectful comment on this post for one entry. Starting on April 15, 2010, you may mention this post and S-O-S Best of Best Book Reviews and Giveaways http://tinyurl.com/3pzn135 on Twitter and either include @dswalkerauthor in the mention or send me a message proving you did this for two entries. You may like my Facebook Page, Delightfully Different and mention S-O-S Best of Best Book Reviews and Giveaways begins April 15th at Help! S-O-S for Parents while indicating your interest in this book for two entries. Post comments at all three sites to receive ten entries into the random drawing. All entries must take place before 12 midnight Hawaii Standard Time on April 30, 2011 to be eligible to win. At least one of your comments must include an active e-mail address so I can contact you if you win. If I do not have a way to contact you or I do not hear back from you within three days, you will forfeit your win and another winner will be chosen. The winner will be announced on May 2, 2011. As soon as the winner’s information is received, I will email their information to Rachel B. Cohen-Rottenberg, who agreed to donate a copy of her book and mail it to the winner. Disclosure/Disclaimer: I reviewed this book from a copy I purchased through Amazon.com. No compensation, monetary or in kind, has been received or implied for this post. Nor was I told how to post about the book! Thank you to all those who entered this contest. The winner is Melody of Life’s Twisted Stitches! Melody I sent you an e-mail tonight. Please respond with your mailing address before May 5, 2011 to claim your prize. Thank you for stopping by and entering. I’m in for this one chance. I will give the book away on my blog – after I’ve read it, of course! I have enjoyed Rachel’s insightful comments on other blogs for a long time now. Thank you for your entry and for offering to do another giveaway after you read it. I am glad others also notice her insightful comments. Rachel is an amazing woman which is why I wanted to do this review and giveaway to help promote her book.